Fester are a black/death metal trio from Norway. They originally formed way back in 1989 and a quartet and two demo's and two full-lengths between then and 1993, when they split up. They returned in 2010 and have since released A Celebration of Death, which is their first recorded material in over 17 years. Fester as I've already said, play black/death metal but infuse it with heavy metal and jazz touches, so it'll be interesting to see what it sounds like. It’s nothing like Nile. There's some really skillful drumming going on and the vocals are raspy growls. The guitars can be heard underneath in the mix and sound almost industrial in the way they're delivered. This however, is just an impression based on the first two minutes of a seven minute song. There's plenty of pace changes and the bass guitar does add in some jazzy riffs when allowed to pierce through the thickness of the rest of the instrumentation. 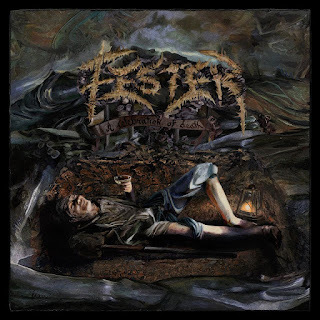 There are certainly a lot of ideas and layers at play and though this song is mainly mid-paced, it has its moments and shows that Fester are not just here to make up the numbers. There's orchestral, symphonic influence at times toward the closing bars as Rites Of Ceres flows into The Black Tower. Fester weave in some cool, melodic guitar layers into The Black Tower, which distracts from those cold, harsh growls. Again this song is mainly mid-paced too and features some nice off-kilter instrumentation. I like the way each song just flows into the next, I think more records should do this, as sometimes bands put silly gaps in between songs that ruin a records natural flow. Well, onto March of Death, A Celebration of Death's longest song at over eight minutes and it has a subtle doom/sludge feel to it, in its winding two-minute intro. At this point as well, the vocals seem more distant and the guitars have come to the fore slightly, along with the bass. Those symphonic layers are back in March of Death and add a layer of sinister feeling to the song, which is nice. It kinda reminds me off some of the ambient black metal I've been listening too recently. I'll Hunt You Down is a pacier track, with strangely, some danceable drums! Maybe it's just me. This album features enough twists and turns inside it's first four tracks to keep you interested, as you move deeper into it and the songs start to become shorter and sharper in places. Metalized is one on those shorter, sharper songs I was talking about. Despite this, it still features a lot of the experimentalism that Fester threw into their opening four songs. Jeg Spytter Pa Deg begins with the sound of people being slashed to death by cold metal, which fits this record down to the ground. Fester return to their grandiose best here. Still those blasting, solid drums hold everything together well. Next comes the two-parter of Last Day of Battle. Pt.1 is an instrumental interlude of sorts, which sounds really cool but is also in keeping with the vibe of the record. Pt.2 is another six minute plus barrage of mid-paced death metal. The bass is more prominent again, adding a good layer of heft to the music. This time, the song features samples of people being killed by warplanes, so Fester aren't just sticking to one era for inspiration. It's at this point too that you realise that this album is playing out a story, and such is close to being a concept album, however not a cheesy one! The penultimate track A Face For A Funeral is another quickened slab of death. It sounds pretty evil too, with the vocals buried in the mix like they are. It's a welcome change though and prepares you for close, Rites of Mortiis. Now Rites of Mortiis is a real surprise. It's billed as a remix and features electro beats amongst the death metal. It sounds very similar to EBM or darkwave and is a great way to end A Celebration of Death. This record may require you to persevere with it but you are rewarded by great musicianship and a few surprises along the way! It's well worth picking this up in one of it's three formats, that are mentioned below. Also Fester can be found on Facebook at http://www.facebook.com/pages/Fester.